Home > Announcements > What’s happening at Lima South Quarry ? There is an enormous amount of activity happening at LS Quarry’s Lima South Pit. 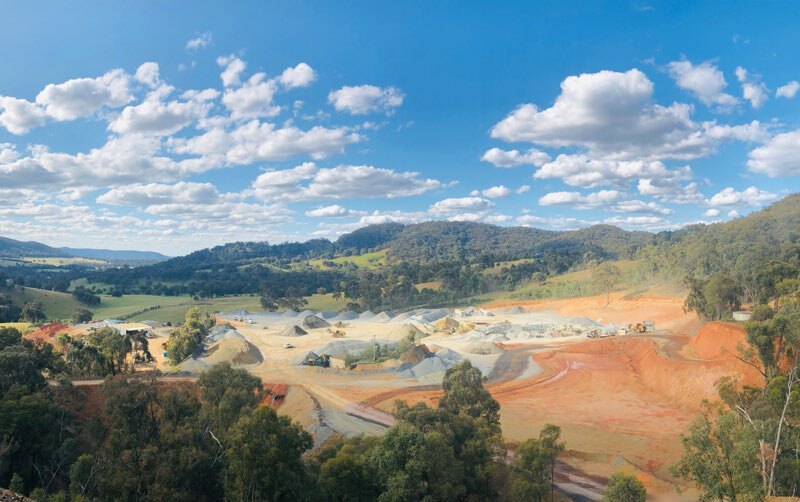 Trenton Day and his production team have been very busy over the last 12 months; stripping overburden from the latest approved quarry expansion area while at the same time, producing more aggregates and crushed rock than ever before. There are over 30 people directly involved in production activities at Lima South including Loader Operators, Excavator Operators, Crushing Plant Operators, Dump Truck Operators, Water Cart Operators, as well as Supervision and Ground Staff. This team has been working hard to keep up with the current level of demand in the North East Region, as well as supplying the construction of the new Pre Cast Plant in Benalla. Last month they produced more than double the normal average monthly production with one full time aggregate plant and two crushed rock plants operating at full speed. The same team has moved a significant amount of earth over the last few months to prepare the site for a new fixed crushing and screening plant. This will result in benefits to the local community through reduced noise and improved dust suppression onsite. We shall be updating you on the progress of the fixed crushing and screening plant in future articles.